A mix of our country & primitive home decor shop and our country life. Welcome! Our first occasional shop opening started today, and runs through tomorrow. Why am I just now posting pics here on my blog? Because my laptop crashed yesterday. OH NO!!!! Here's hoping I can save it, but I haven't had time to try yet. Anywho, I was a little nervous about today. Would our customers come back? Or would they have moved on since we haven't been open since last December? They came back!! Thank you! We appreciate you all so very much! Here's a few pics from around the shop. A sampling if you will. 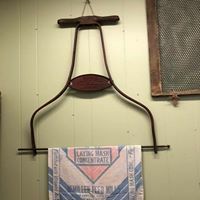 The wringer washer stand is still available. It's a 3 piece set; the stand and the two tubs. 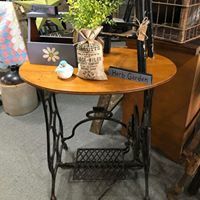 We pieced this together - we had sewing treadle legs with no top. We had a top with no legs. 2 old bikes. 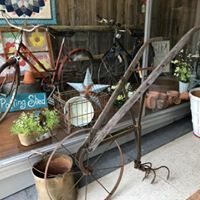 A hand push cultivator plow. Can you say yard ornaments? This old box fit perfectly on the rusty metal stand. It sold quickly after we opened. All through the day, more folks came in asking for it. It's humble look was quite popular! 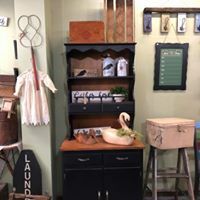 This sweet little dresser also sold quickly, as did the barrel and the box. 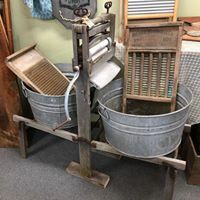 The wash tub on a stand is still available. Perfect for flowers, or for ice and some cold drinks. Love it's 2 tone look! I'm blaming the cut off pic of the this cupboard on my computer problems. I apparently downloaded the wrong pic. So, it is what it is at this point. But trust me, the cupboard does indeed have a top. Take me home, country roads!!! What do you do with an old lawn roller? Take the roller part off, and turn the handle into a quilt rack! We added the mirror to the desk to make a vanity. And the woods matched perfectly! 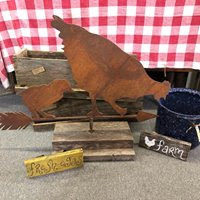 The hen and her baby were a weather vane with a broken bottom. We cut the broken part off, and mounted them on a couple pieces of wood. They walked out the door right after we opened. 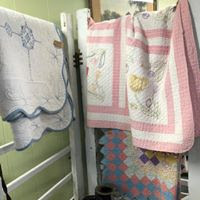 Nice quilts for those chilly spring nights! As I am posting these, every photo looks blurry. Maybe because I took them from my Facebook page, instead of from the phone. This whole laptop being down thing is really messing with my posting skills. Wish me luck in trying to save it. And if you can, stop in and see us tomorrow! We had planned to close for the winter, hit the auctions hard, and open back up in March. What we didn't take into account though is that auctions in the winter are far and few between. And the few there were didn't have the cool old stuff we fill the shop with. We have a good start on bringing in more of the cool old stuff. And we have been busy creating and upcycling. We are carrying very little over from last year, so we have a lot of space to fill. We feel confident we can do that by April. We hope to see you on as many of these weekends as you can come! We are looking forward to year 2 as an occasional shop. And we promise to make it worth the wait. The stories she could tell! 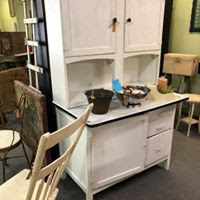 If only this old Sellers Cabinet could talk. In fact, she did tell me a bit of her story. See the wood attached to the side on the right? It should hold a wooden shelf. There was a shelf there, covered in dirty pink paper. I pulled it out to clean it, and when I took the paper off, it wasn't wood. It was a folded up heavy cardboard calender. That makeshift shelf has worked for a long time! Love the resourcefulness of whoever came up with a solution using whatever they had laying around the house. The cabinet had another story that is a mystery. The pull out table part was in bad shape. It's not enamel like most, but rather some kind of wood. Maybe its the underlayment for enamel, and the enamel is missing? It was all stained and nasty looking, so I painted it black. My own version of resourcefulness. First off, you have to understand.... George has always wanted a sleigh. It comes up every Christmas. And throughout the year. 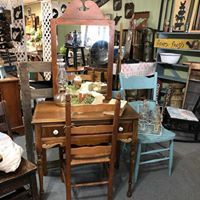 In antique shops and estate sales. Around the dinner table, and riding in the car. He has admired many, but sleighs, REAL sleighs are expensive. So, he has just dreamed. A couple days ago, I saw this picture on a local auctioneer's Facebook page. I texted the picture to George, with the comment, "Boy, she's rough." He agreed, but said he was interested. I went to the auction, and he stopped in for a few minutes on his way to an appointment to get the tires rotated on our car. He looked the sled over, then came over to me with a very excited look on his face. "Don't let it go for less than $150." "She's fine, I can work with her". 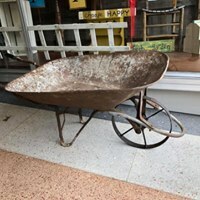 So, he left for the car appointment, and I stayed at the auction, rather hoping that the sleigh would go for $160. Don't get me wrong, I want George to have a sleigh. And a fixer upper is fine. But, BOY, SHE'S ROUGH. 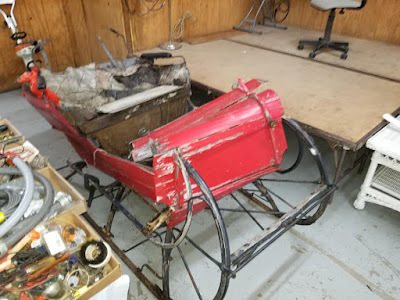 The sleigh finally came up on the auction block. The auctioneer tried to start the bidding at $100. I held up my bidders card. When George got back to the auction, he sat down beside me. I looked at him and said, "don't ever think I don't love you", and he broke out in a grin. Apparently he is the only one that didn't notice that BOY, SHE'S ROUGH. "Yes, she's rough, but she's perfect. That makes her easier to take apart and fix." he said with a huge smile on his face. He looked like a kid on Christmas morning. Our October event has now come and gone. Thanks so much to all who came and supported us! Whew! We're tired! 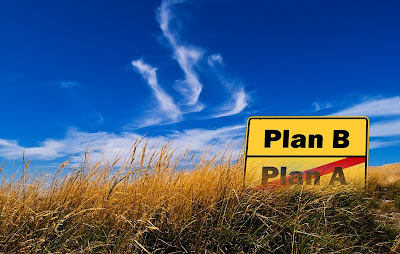 But, we are already preparing for the next one. In fact, we bought a truckload for the November one a week ago. 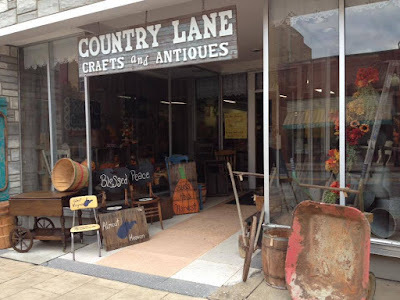 We went to the special Saturday flea at Roger's Ohio. They usually are on Friday, and we don't get to go because of George's work schedule. But every so often, they hold one on Saturday, and we took advantage. We did put a couple things in the October event: the tea cart and the tall primitive cupboard. And they both have already sold. We didn't take the trailer. It was a drizzly day, and we figured we wouldn't find much. It took some serious stacking skills to get everything loaded in the truck. By the time we were done, we started thinking more seriously about buying a box trailer. We have a couple trailers, but always have to use tarps. By the time we were home a couple hours later, and had driven through a couple SERIOUS DOWNPOURS, we were looking box trailers up online. The rain didn't hurt anything. As soon as we got home, we got everything dried off. It had all needed a bath anyway, and Mother Nature gave us a helping hand. But honestly, we would rather do it ourselves. And yeah, we are looking for a box trailer. Our next open date is November 23 & 24, which is Black Friday & Small Business Saturday. It happened again. 2 people wanting the same thing at the same exact time. 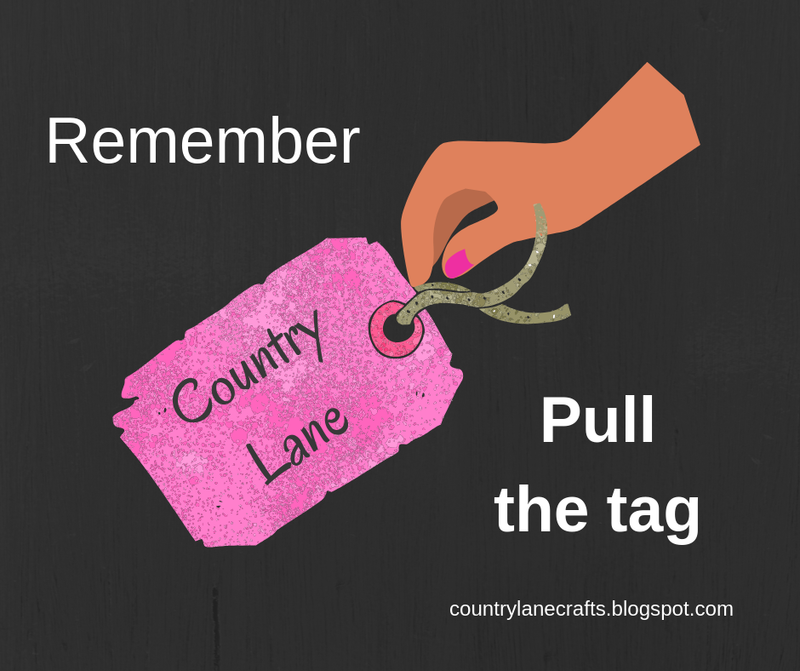 If the one who missed out had pulled the tag, she would have got it. As shoppers, we tend to look at something, then wander around looking at other things before we go back to get what we came in for. 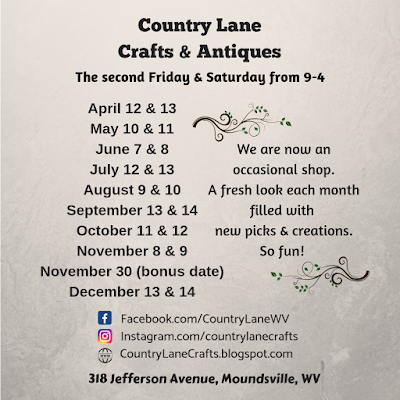 But with our one of a kind pieces being promoted on our Facebook page, chances are good that more than one person will be coming in for the same thing... at the same time. So, if you are sure you want something, pull the tag and bring it to either me or George at the counter, and it will be yours to buy. What was the piece that both wanted so badly this time? This old primitive cupboard. So prim, so sturdy, so cool. We set several things outside before we open, and the lesson applies there too. If you are one of the folks who come early and stand in line waiting on us to open, and you see something you want outside, pull the tag. See that plow leaning against the corner on the right? The customer who wanted it was waiting in line to get in, but didn't pull the tag. She told me as soon as she came in that she wanted it, and I told her to hurry and pull the tag. She was just lucky that no one else pulled it ahead of her, or she would have missed out, even as she stood there in line. This is the only downside to the unique pieces we work hard to find. Only one person can buy them! A metal dental cabinet. It sold as soon as we opened. Barn gates, straight out of a sheep barn in Ohio. The corn sheller was from the same barn. The sheller and some of the gates are still available today. The blanket box is still available. Love it's dovetailed corners! Some of the ladders have sold, but we are actually bringing more in today. Still have the iron wheels. This set is in great shape. We have more that are in a bit more used condition. These chairs are screwed together, making a bench. The large whiskey barrel with the green bands sold yesterday, but the shorter one is still available today. It still has it's wooden spigot. 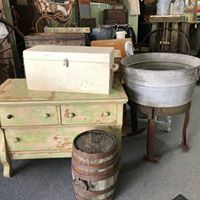 We have lots more... old windows, lots of enamelware, signs, wooden boxes, old chairs, kitchenware, goats milk soap, WV decor, the list goes on and on. Open today (Friday, October 13) from 10-5. Our next open weekend will be November 23 & 24, which is Black Friday and Small Business Saturday. After that, we will be open each Friday and Saturday until Christmas. Hope you can come! 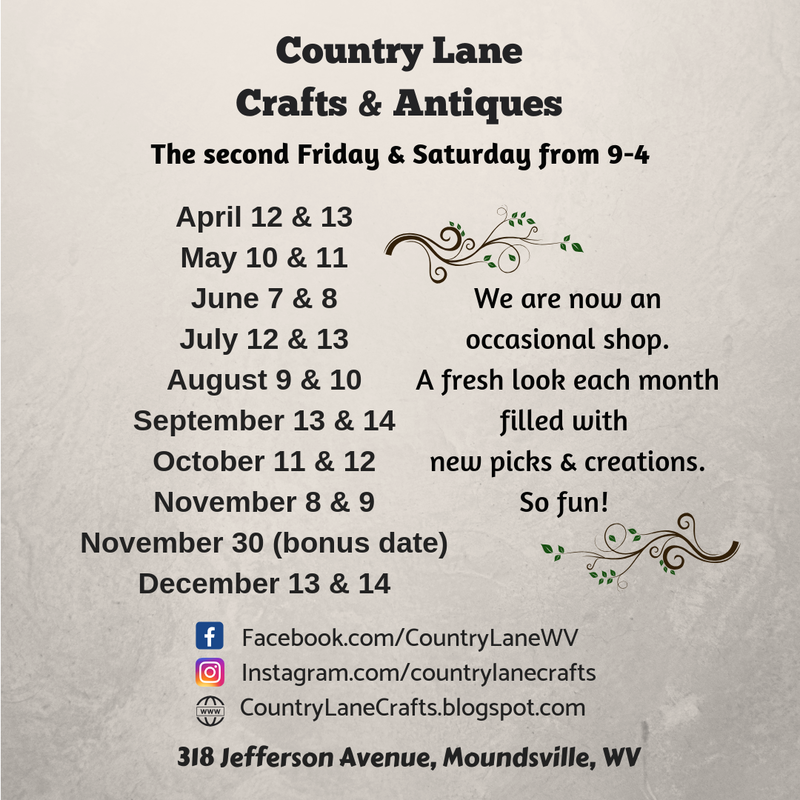 318 Jefferson Avenue in Moundsville, WV. We are in the middle of our September open weekend. Whew! Another busy month getting ready! The pumpkin sign is painted on a large crate side that we took apart. Love the wire running across it. These doors! So perfectly chippy! The first thing that sold? This dresser. I could have sold it several more times, if only I could have twitched my nose and made more appear. Quilts. Need I say more? The white mantle went quickly too. We still have the brown one behind it. Another marriage. 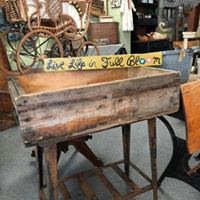 A child's roll top desk, placed on a cast iron sewing machine base. Truly one of a kind! 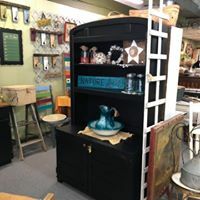 The black dresser/buffet sold as I was uploading this picture. Love the rockers! I do believe the coolest thing in this display is the 3D horse picture. We will be open again tomorrow from 10-5. Actually, we will probably open at 9, because the street in front of us will be holding our towns annual Fall Festival. Always a great day to visit Moundsville, WV! 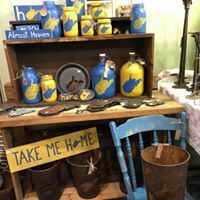 Our home decor shop is located at 318 Jefferson Avenue in Moundsville, WV. We recently switched from an "open 5 days a week" shop to an occasional shop, open one weekend a month. It's been an exciting change, and has enabled us to bring in lots of new treasures each month. 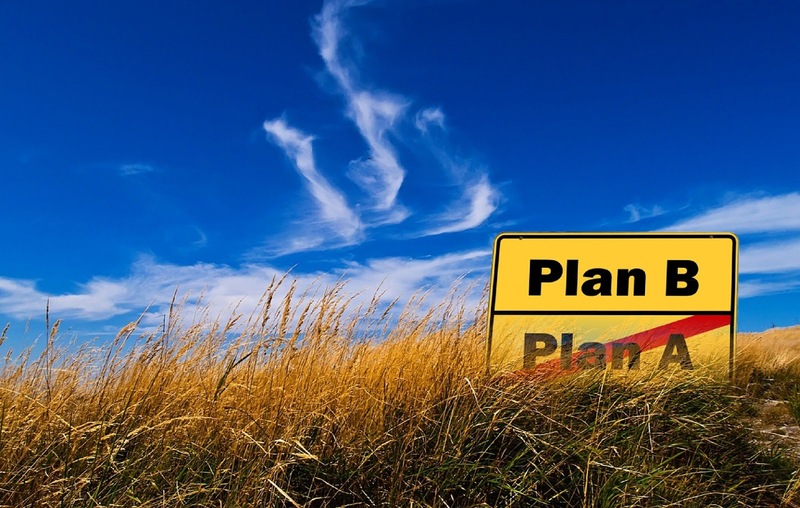 We hope you wil be able to stop in at one of our monthly events. In the meantime, sit back, scroll around, and enjoy a peek into our shop life, and also our life in the country.